« boise :: how’d you get so crafty? So there seems to be a moth problem in this fair, yet chilly city and favorite sweaters and socks are breezier than they should be this time of year. Instead of scrapping them, mend them with the age old technique of darning! 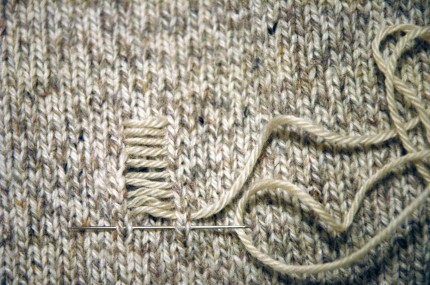 The Toronto Church of Craft is hosting a darning workshop with wool connoisseur Becky Johnson. Bring in your old, your haggard, and your much loved woolens and learn how to make them wearable for another season of deep freeze. We’ll be congregating at Heartbeat 960 – 960 Queen St. West (map) on Saturday, January 16 from 1pm to 4pm. Drop on by, and mend! We’d love to see you out of hibernation! This entry was written by thegood, posted on January 11, 2010 at 9:10 am, filed under Toronto. Bookmark the permalink. Follow any comments here with the RSS feed for this post. Post a comment or leave a trackback: Trackback URL.